Given recent interest in the work of the ancient Athenian soldier-turned-historian Thucydides in the foreign policy community—primarily due to Harvard academic Graham Allison’s popularization of the “Thucydides Trap” thesis, that there is an innate tension between resident and ascendant powers that historically has led to catastrophic war—it is perhaps worthwhile to offer some advice to novice readers of ancient Greek texts. The most important lesson is also the most obvious: Read the text very carefully; preferably, in the original language or a scholarly annotated “literal” translation. One cannot assume that Thucydides is not a careful—or even esoteric—writer and one has to weigh his words carefully. This should be a given for any serious analyst, but in the case of Thucydides (or any ancient heavyweight) it is of particular importance. The entire composition has been artfully designed to underline subtle points that are perhaps not accessible in a first or cursory reading. To grasp this, it is important to understand that Thucydides, rather than a contemporary scientific or professional historian—a scholar trained in methods of historical analysis—is a speculative historian, who is not interested in a mere chronicle of war and politics during the Peloponnesian War, but rather is trying to understand the nature of war and politics. He is thus similar to philosophical politicians like Abraham Lincoln, who advised his countrymen to disenthrall themselves to better understand the nature of the conflict they were engaged in. Here are a few other tips and general observations. Third, many scholars argue that Thucydides takes a pro-Spartan stance, or, rather, hones the Spartan perspective in recounting the war. This, given Allison’s argument that America plays the militaristic hegemon Sparta confronting the rise of empire seeking Athens-China, makes the text especially intriguing to American readers. Thucydides appears to show that the Spartan regime is preferable to Athenian democracy because it is more stable and moderate and as a consequence less likely to engage in or instigate war. Yes, with regard to sustainability and preservation of its domain, the Spartan regime seems preferable; nevertheless, the closed and conservative Spartan society was institutionally not capable of producing the high culture and uniquely daring individuals of Periclean Athens. Free thought rather than an obsequious veneration for the gods created poet-dramatists like Aeschylus, philosophers such as Socrates, soldier-statesmen like Pericles—and incomparable historians like Thucydides. With the exception of Brasidas, contemporary Sparta produced able warriors, but few other remarkable individuals. On some level, Thucydides reveals in the course of his history an allegory of Athenian brio and Spartan platitude but ultimately Athenian tragedy and Spartan comedy. These are not the Athenians of the plain of Marathon or the Spartans of Thermopylae. Decadence has infected the Grecians at this the enlightening dusk of their peak: Thracian mercenaries in the pay of Athens slaughter schoolchildren at Mycalessus “without mercy”; near 300 Spartans lay down rather than face the sword at Sphacteria; and the derisive comedian, Aristophanes, pens The Clouds. Thucydides narrates what he describes as the greatest “motion” of his time, an epic civilizational drama—and a slaughter bench—in which all actors will suffer and ultimately lose. Fourth, let’s revisit what seems to be the chief cause of the war. “The truest quarrel, though least in speech, I conceive to be the growth of Athenian power, which putting the Lacedaemonians (Spartans) into fear necessitated the war.” The least avowed, though truest cause of the war, according to Thucydides, is packaged by Allison into the alleged Thucydides Trap. But this provisional assertion is placed strangely by Thucydides at the conclusion of his introduction to a history in which he attempts to show the superiority of current Greece to the primitive inhabitants of the same land. The reader is led to question the insertion and slant of this thesis—Athenian culpability—placed at the end of his Greek archaeology and immediately before Thucydides presents what contemporary Greeks noted as the proximate causes of the war. Indeed, a close reading of Thucydides’ history demonstrates that Athens was compelled to compel Sparta to war. Athenian hegemony and naval empire, as well as the less well observed Spartan dominance and empire on land, Thucydides suggests, was necessitated by the Persian invasion and fortified by the apparent natural law of the prerogative of the stronger. 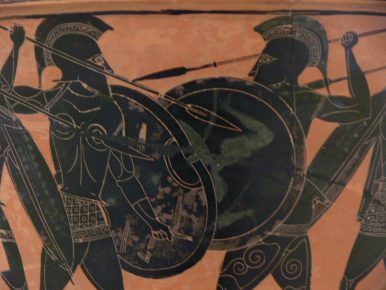 Athens and Sparta are fated by historical circumstance and internal drive to rule. Interestingly, in the last chapter to his introduction, Thucydides lays out again his claim that the Peloponnesian war is superior to the greatest previous war against the Persians, specifically—and only—in regard to the sufferings it caused. These sufferings are of two kinds: those induced by men and those induced by nature, or, for the authentic pagan mind, the gods: earthquakes, eclipses, droughts, plagues. Immediately after this assertion, Thucydides attributes the cause of these sufferings to Athenian aggrandizement. Consequently, the too obvious story in neon lights, as espoused by some modern scholars, “Arrogant Athens laid low by law loving Lacedaemon” is revealed in the course of an exquisitely crafted text to be a salutary morality tale of divine retribution and a less obvious philosophic inquiry of the war rather than a mere expose of power politics. Fifth, to elaborate on the point raised above, Thucydides is often interpreted as the proponent of power politics best exemplified in the infamous Melian Dialogue. However, again, a careful reading of the text reveals a deeper ambiguity. Is Thucydides genuinely teaching that might makes right or is he more interested in illustrating Athenian hubris or both? Perhaps looking at the sequence of events unfolding in the book might yield an answer: Pericles famous funeral oration extolling the virtues of Athenian empire and democracy at the beginning of the war is followed by the Athenian Plague; the Melian Dialogue is followed by the doomed Sicilian expedition. Could it not be that Thucydides rather than arguing for realism in international politics tries to underline that hubris can be mistaken for realism particularly in a Type A society like Athens and that hubris, as Ozymandias knows, never goes unpunished? Sixth, the carefully chosen words of the text often reveal more than initially meets the eye. Let’s take Thucydides’ characterization of the commander of the doomed Sicilian expedition, the gentleman general Nicias. Without going into all the details of the general’s character it suffices to say that he is the Athenian equivalent of the American Civil War General George McClellan, ambitious but cautious, lacking the élan and hard headed ruthlessness to win a military campaign (and like McClellan also always demanding more men and resources.) Thucydides attributes the ultimate defeat of Athenian forces in Sicily to Nicias’ piety (he was “too inclined to believe in the interpretation of omens and that sort of thing”, as Thucydides puts it in the text) and his personal irresoluteness born of moral uncertainty and fear of Athenian public opinion. The key verb here is “chanced to happen” (etyke). Thucydides, like other ancient authors, is very deliberate about the use of some form of this verb. For example, Xenophon, who finished Thucydides’ history of the war, must have carefully studied his predecessor’s writings. He repeatedly uses the phrase “chanced” in his works (e.g. “Clearchus chanced to be engaged in sacrificing,” which the wily Spartan used as a pretext to both delay a crucial decision to the Persians and coalesce his own Greek generals) to underline that deliberate choice determined the direct behavior of each conscious individual, and which both Thucydides and Xenophon chance to partially cover to intimate to the careful reader the cause of the dissimulation. In the instance of Nicias, Thucydides tries to convey that it was not chance that left the general in the infirmary but a deliberate decision not to participate in battle. In other words, he wet his tunic. My explanation for this is simple: He rightly must have understood Thucydides’ intention to question rather than praise Nicias’ “virtue” and ostensibly lament his evidently undeserved fate, which any fastidious reader would note and further note the silent exclamation mark of the wise Hobbes, still recognized as the most studious and thorough translator of the work. Thucydides delicately critiques Nicias’ devotion to the old customs, implicating his old time religion and Spartan-like caution in his ignominious defeat and untimely death and the ultimate fall of an Athens, that out of guilt for overextending its empire, promoted a god fearing (and eponymous) peacemaker to lead its lavish attempt to conquer Sicily. The disgraced but unabashed Alcibiades, who was compelled to turn coat and shuttle his hubristic skill set to Sparta, was the real man for the job. It thus points back to Thucydides’ critique of Sparta discussed above. The whole point of this article is to show that there are various ways of interpreting Thucydides that to the careful reader can yield valuable insights into the nature of political life and questions of war and peace that go beyond the limited extrapolation espoused by Graham Allison. Indeed, to the philosophically inclined analyst, Thucydides reveals that most analytical systems (call it “realism” or “power politics”) are first and foremost founded upon intuition rather than scientific/historical proof sought by modern historians and therefore lack a foundation other than self-assertion and the application of artificial rules that at the end are applied quite arbitrarily. In other words: the Thucydides’ Trap itself could very well turn out to be little more than a trite trope. Forget quick victories; great power wars are usually determined by protracted attrition warfare.